I have been thinking a lot about bandwidth, telecom services and the traditional telecom equipment market of selling to service providers. I posted a snippet of my thinking in my 11.23.11 Notebook post: “Telecom Equipment Markets: I sent the four charts to the left to a friend the other day. Both of us had careers in networking in the 1990s. He came back at me with following argument: “Carrier traffic growth is 40-60% annually, carrier CAPEX growth is ~3% annually and carrier revenue growth is <10% annually.” The only way to reconcile that construct is to drop the cost per bit. Who will bear the burden of that cost reduction? I think the most likely candidate is the equipment providers. I was reading something I wrote back on March 1, 2007. I stumbled on it through a Google search for a Mary Meeker quote and a post from my old blog came up on SeekingAlpha.com. It is an interesting read because we are almost five years on from when it was written. You can read the complete post below as it includes the whacky email I got from the Level(3) investor fanatics, but the part I want to focus on is the recycled thesis as to networks and demand. I believe we recycle these assumptions because of doctrine. Broadly defining the technology ecosystem to include the people and companies in technology, as well as private and public investors and analysts and consultants I believe we trapped in loops because of doctrine. 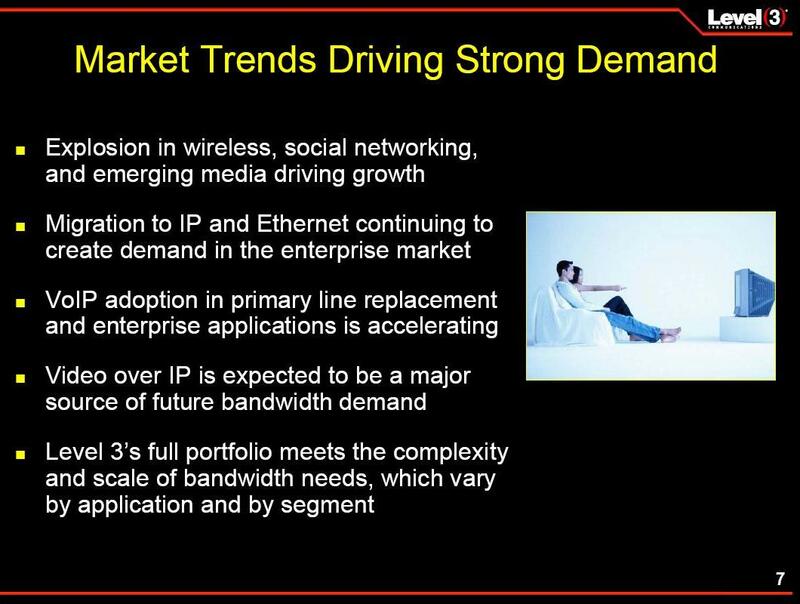 The thesis on the growth of IP and video has been showing up for 5-10 years or more in investor presentations. In the conclusion of my March 2007 post I asked: “…should I conclude that companies that can own more of the end to end (i.e. fully vertically integrated) distribution chain of commerce for data (i.e. video, VoIP, etc) will realize higher profits? Or should I assume that bandwidth consumption will increase significantly that cost of the replacing the capacity will result in scarcity and drive bandwidth costs higher?” Almost five years later, I am going to simply state the theses I am working on, but I think they require to be framed in the concept of doctrine. The concept of doctrine enables technology people to make assumptions. Assumptions are great as long as they hold. When I refer to doctrine I am referring to procedures that ecosystem participants follow because they have been trained to reason and act in a certain manner within the command and control structure of their business and technology. We design networks, manage companies; evaluate technology and markets according to a common set of doctrines that have been infused into the technology ecosystem culture over many decades. I was thinking along this thought line in mid-October when I posted “I also believe we are all susceptible to diminished breadth in our creativity as we get older. Diminished breadth in our creativity the root cause as to why history repeats itself and another reason why when we change companies we tend to take content and processes from our prior company and port them to our new company. This is especially true in the technology industry. We recycle people; hence we recycle ideas, content and value propositions from what worked before. Why be creative when it is easier to cut and paste? As a casual observation it seems to me that most people working in tech have a theta calculation as to their creativity. I believe a strategy to guard against creativity decay is to look back on the past and critique the work.” In mid October I had not fully fused the thesis of creativity fail or creativity theta with doctrine. The idea to link the two concepts occurred to me last night as I was reading Shattered Sword for the second time. We have been waiting on the video tsunami for five years. When does it start? Bueller? Bueller? Has anyone seen the video tsunami? Thesis: There will be no video Tsunami. 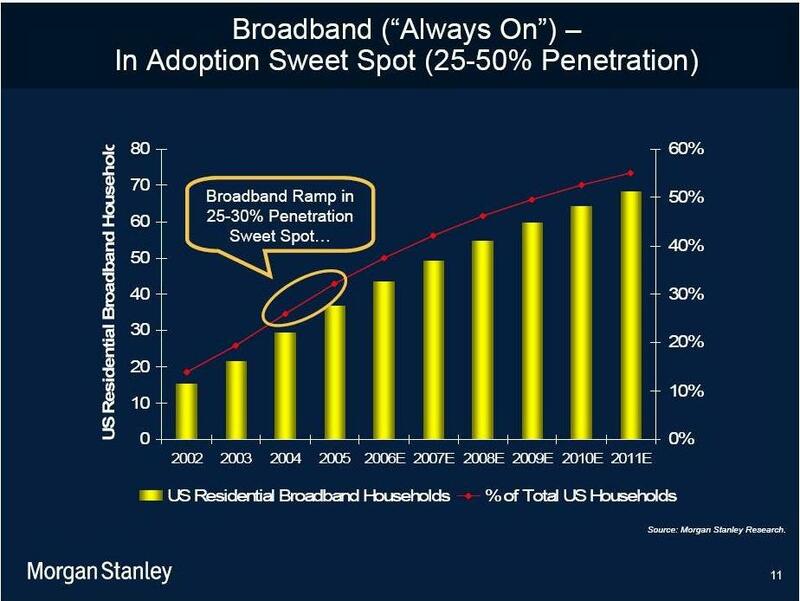 Can we all agree that bandwidth is deflationary? The trend for bandwidth is the same as the trend for storage and compute. Thesis: Owning the compute point is far more valuable than owning the pipes between the compute points. Service providers consolidated to protect margins (i.e. ARPU) and to slow the rate of revenue decline, thus extending and lowering theta. Thesis: COs become data centers. Now that the video tsunami thesis has become passé, the new thesis is the cloud. The cloud is not a value creation engine for hardware. It is enabled by hardware, but hardware trends are deflationary. The value in the cloud will be enabled by software. Thesis: Networking transitions to a virtual software function that runs in the server. The last few days have been full of interactions with people interested and passionate about networking and investing. The result of these interactions is I have either discovered a market discontinuity or an investor discontinuity. To present the discovery process I have created six perspective frames. Individually they can be considered interesting or meaningless. Considering the axiom that perception is reality, assembling the frames into a single view does reveal a market or investment discontinuity. Breaking some code words in this email, the term “CroweBonics” was this investor’s play on words with a historical reference to a network model called Mini-Max I that Level 3 asserted back in the 1999-2003 timeframe. I did download a version of the Mini-Max I model from the Internet Archive. You can search for it on the IA site or download the PC version of the Excel spreadsheet here: Download minimax.xls. Here is a link to a fun interview that James Crowe did with Wired Magazine in 1998. When VCs read the Infinera (INFN) S-1 is their reaction positive or negative to the funding model? I am not critiquing the business plan or the company, I am strictly discussing the funding model divorced from the company. Do VCs think $300M or $400M funding plans are an investment thesis that works? Speaking with several VCs, I think the answer is no. My observation is that $200-400M funding plans do not work over the long term. How many companies in the networking space could be supported by venture capital if they all required $300M and six years to achieve an IPO exit? Ciena (CIEN) raised ~$40M before their IPO. Cisco (CSCO) raised $2.5M of venture capital from Sequoia in 1988. Eighteen months later, Cisco went public. Nineteen years later, system level networking companies are filing for IPOs after funding plans of $100 to $400M. Recently I have been talking to VCs about startups in the networking space. Where are they? Why are so few? I think problem is the funding plans required to make these companies successful are enormous and the barriers to a successful IPO are daunting. If there is or will be an explosion of video, a video tsunami on internet, I would expect to see a number of startups in the video or internet infrastructure space. Where are they? Where is the next optical switch company? Where is the next Infinera 2? Where is the next long-haul or metro WDM startup? How about another router or switching company building products with the next level of integration, density and cost improvements? Here is a link to a collaborative story on whether New England will ever have a Cisco Systems. My point is that venture capitalists are paid to make risk investments and they are either (1) asleep while the video tsunami is approaching or (2) they do not see the approaching wave because the funding investment level does correlate with the external market hype. 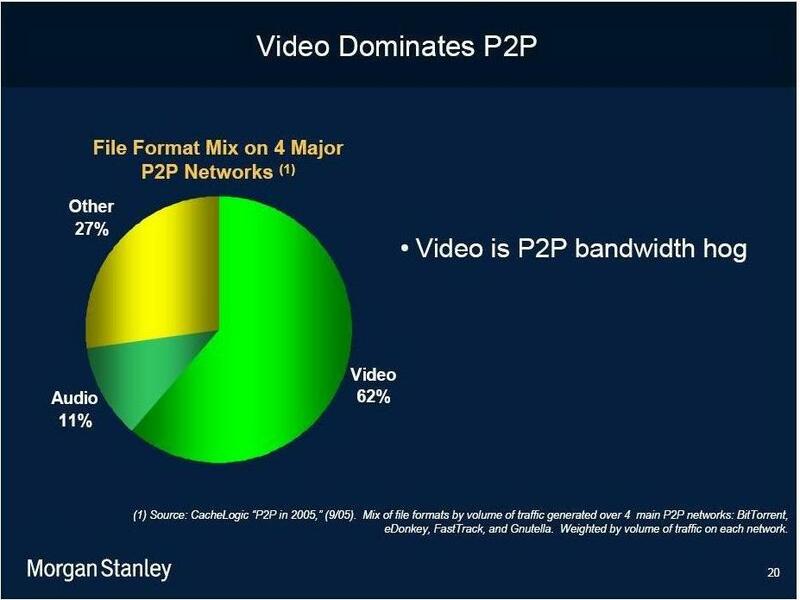 In the process of looking for collaborative data points regarding the impact of video on the internet infrastructure, I reviewed the recent presentations from Mary Meeker’s team at Morgan-Stanley. You find an index to their technical presentations here. I find value in the material from Mary and her team because of their consistent effort over a long period of time. The research material starts with The Internet Report from 1995 and spans the entire time period to today. Few analysts and technical people have such a long historical record available for comparison, review and critique. It is a point of quality in her team’s favor to make available a vast amount of material to frame historical perspectives. Here are three slides from their recent report on the state of the internet presented at the Web 2.0 Conference inSan Francisco in November 2006. 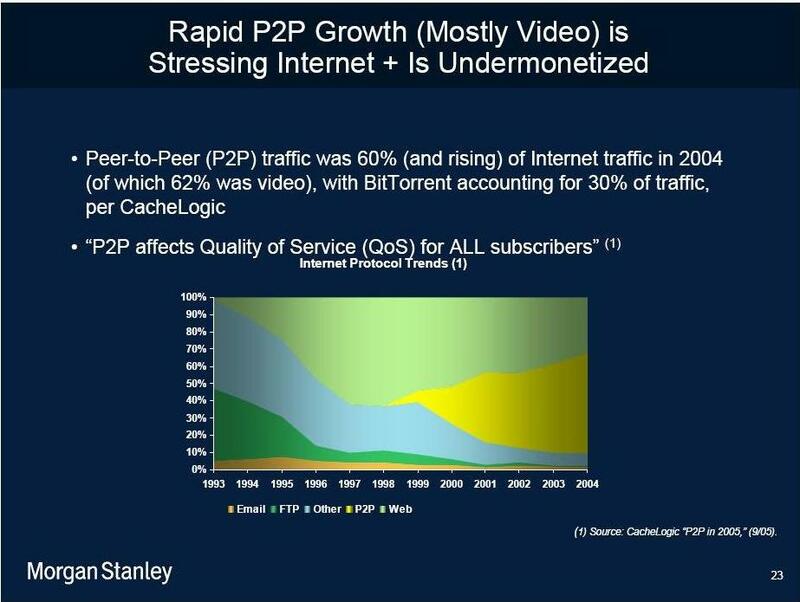 The first slide graphically illustrates the emergence of P2P traffic on the web, which Meeker cites in slide 20 as 62% video. The third slide is the question slide and I do not think we have a definitive answer. Clearly the companies that own long-haul fiber backbones (e.g. L3, AT&T, Verizon, Sprint) would like to see high value commercial video as a business driver. The P2P video traffic is a significant driver of bandwidth, but it is similar to the Napster event of the late 1990s – it is under monetized. P2P traffic that is non-monetized is the killer application for service provider in negative manner. The whole net neutrality debate is centered on paying for use of bandwidth. It is the toll road analogy. If I am running a P2P service and it is traveling over someone’s backbone that I accessed through a different local broadband provider, the backbone provider is not gaining income from the packets I sending which are a stream inside a fix service contract between the local bandwidth provider and the backbone provider. This is the challenge presented by the uncoupling of pipes and services in the service provider model. Technical evolution now allows services to exist separate from the connectivity pipes, or in other terms services can exist outside of the network. When this uncoupling occurs, service providers are not monetizing the services running inside the pipes (i.e. circuits, wavelengths, etc). This is the challenge of P2P video. Who is gaining what percentage of the video revenue in a P2P service? There are monetization challenges in the current market construct for commercial video and P2P video. The chain of commerce for the monetization of video is not as simple as growth rates will drive top line revenues. The video chain of commerce must be considered in terms of the uncoupling of services and pipes. This is the heart of the new neutrality debate and the basis for the assumption that service providers might evolve towards being only connectivity providers. – Infinera S-1 pages 51-52: “Increased Demand for Network Capacity: The global market for optical communications equipment is estimated by Ovum-RHK, a third party industry analyst, to be nearly $12 billion in 2006. Our DTN System currently competes in the WDM segments of this market, which we estimate to be $3.7 billion in 2006. Frame 6: The Quest for the Holy Grail: The Killer App! In their famed Internet Report, Mary Meeker and Chris DePuy of Morgan-Stanley declared that “at a minimum, e-mail should become pervasive. So should Internet/Web access: Email is the “killer application of the Internet today, and browsing through information services the “killer app” of tomorrow,” [see, the Internet Report, Mary Meeker and Chris DuPuy, February 1996, page 1-2]. Now that we have transitioned enough of the Web 1.0 (i.e. dialup) infrastructure to the Web 2.0 (i.e. broadband) infrastructure, is video the killer application, the Holy Grail or the next great hope that the internet has been waiting for? Anecdotally it appears that video and the affect that video is having on the internet is being used too loosely. It is almost taking on a life like that of the Worldcom fable that the internet is doubling every 100 days, which was a story that found itself in many a business plan presented to a venture capitalist back in the 1990s. Here is a link to an excellent paper on the history of the internet doubling every 100 days, myth and legend. The question is whether video is indeed the application that changes the infrastructure of the internet or is this a variation of the second derivative of growth applied to the internet using video? Here is another reference to the coming data tsunami and how the data overload assumption becomes propagated. I am not disputing that it can or will happen, I am stating that we are missing metrics to support the assertion. I did some channel checking with people who sell optical networks. If there was a massive video tsunami on the way, I think the service providers who own long-haul optical networks are also missing the warning. People on the front lines of the optical wars tell me that metro networks are hot and growing, but the long-haul networks are just adding capacity. Qwest is in the midst of a rebuild of their first generation long-haul gear acquired from Nortel (which started the whole 10G bang, as in it was the first 10G gear deployed) and AT&T (T), Sprint (S) and Verizon (VZ) are fixing portions of their networks and adding capacity. What is not happen is there are no new overbuild backbones occurring. No service provider is pulling new fiber. The optical market is far healthier then it was two years ago, but we are not back in the days of the late 1990s when service providers were ordering optical equipment at $100M to $500M per purchase order every quarter. Google (GOOG) purchased YouTube.com because they believed they could monetize the video streams and/or monetize the advertising business that could be developed from the YouTube.com daily user base. If the video traffic in terms of transmission bits was the most valuable asset, then I would have expected Google to buy the pipes, but they bought the content and the users instead of the pipes. How much traffic will Slingbox and DVRs produce in the network? Can service providers monetize this traffic greater than the connectivity of the pipe that connects to the box? If video is indeed the explosive, killer application that internet has been waiting for, where are all the startups that are going to provide the next generation of infrastructure? Have we reached a point in the service provider model to conclude that the horizontal integration model won over the vertical integration model? This is the inverse of the assertion Level 3 extolled back in the 1999-2001 time period that “Silicon Economics was Disrupting the Vertical Integration Model” of the service provider industry. Today, the service provider market looks more like a fully integrated vertical market structure then a set of disparate horizontally focused entities. Andrew Schmittat Nyquist Capital introduced me to the Invisible Hand Services’ Metro New York Liquid Bandwidth Exchange. If I look at the flattening of the price curve, should I conclude that companies that can own more of the end to end (i.e. fully vertically integrated) distribution chain of commerce for data (i.e. video, VoIP, etc) will realize higher profits? Or should I assume that bandwidth consumption will increase significantly that cost of the replacing the capacity will result in scarcity and drive bandwidth costs higher? I chose the title of this post because I can see either a market discontinuity or investment discontinuity in the effect that video is having on the internet. As always, thoughts and comments welcome, whether private or public.